A new study shows that rats see the pain that other rats are suffering. Rats are amazing social beings whom many people love to have as companion animals ("pets"). 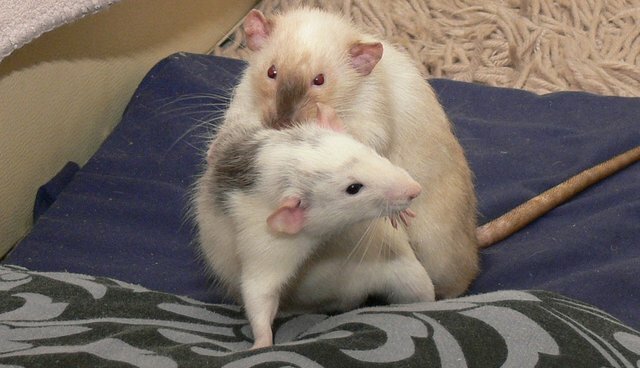 These lovely rodents also continue to be horrifically used and abused by the millions in laboratory research. Detailed research published in prestigious peer-reviewed academic journals show that rats laugh, enjoy being tickled (see also), and display empathy, yet, in the United States, they remain among the 99 percent of nonhuman animals (animals) who are used in all sorts of invasive research and who are thoroughly unprotected by the federal Animal Welfare Act. Indeed, the Animal Welfare Act doesn't consider laboratory rats to be animals. Rats, mice, and birds are excluded from the definition of animal in the federal Animal Welfare Act. As I wrote in an earlier essay (please see "Rats Like Tickling: Why Is the Animal Welfare Act So Lame? "), how in the world do you explain to a youngster (or anyone else, for that matter) that these animals are not animals? It strains credibility that those writing the AWA can so easily get away with such rubbish. As stunning and absurd as this may seem, their exclusion from protection means just about anything can be done to rats "in the name of science." And, indeed, rats do find themselves on the receiving end of the most egregious and brutal treatment at the hands of researchers. Rats read the pain in the faces of other rats. Though recent studies have shown that rodents express emotions with their face, whether emotional expression in rodents has a communicative function between conspecifics is still unclear. Here, we demonstrate the ability of visual recognition of emotional expressions in laboratory rats. We found that Long-Evans rats avoid images of pain expressions of conspecifics but not those of neutral expressions. The results indicate that rats use visual emotional signals from conspecifics to adjust their behavior in an environment to avoid a potentially dangerous place. Therefore, emotional expression in rodents, rather than just a mere 'expression' of emotional states, might have a communicative function. So, what are we going to do with this new discovery? There are non-animal alternatives. Many people, including researchers, strongly disagree with Dr. Mogil's assertion that there are no non-animal alternatives (see also). Dr. Mogil also developed pain grimace scales for mice and rats and was part of a team that discovered that mice display empathy. Enough's enough: The federal Animal Welfare Act continues to be lame. It's about time that those people who are responsible for writing legislation to protect other animals from invasive and abusive research use the scientific information that is readily available. It is inexcusable not to do so. The federal Animal Welfare Act in the United States is lame and continues to permit the horrific abuse of tens of millions of animals each year "in the name of science," when there are ample non-animal alternatives. A good way to begin to ask for change and to spread the word about the emotional lives of rats and other animals is to contact members of Congress and ask them to do something on behalf of other animals and explain that there are solid scientific reasons to do so. Note: I just learned about an essay called "Victory! Arizona Vetoes Bill That Says Farm Animals Aren't Animals." Amen.